"The Substance" Clone Recipe Amount of Apollo Bittering Hops? I was looking at this recipe and was wondering if I should assume 1oz bittering hops? The recipe states Apollo for bittering, but doesn't state the amount. Re: "The Substance" Clone Recipe Amount of Apollo Bittering Hops? The recipe also doesn't specify alpha acids. Assuming about 18% alpha, you only need 1/2 ounce of the Apollo to hit about 70 IBUs. You can use the full ounce but it's just a waste of 1/2 ounce since no beer on Earth has more than about 90 IBUs, that's the ceiling limit for what is soluble. Re: &quot;The Substance&quot; Clone Recipe Amount of Apollo Bittering Hops? If this is to be a NEIPA I would keep the bittering charge low, maybe 1/4 oz. The limit for IBUs is higher, but not much higher. 100 to 110 is what I have usually read. One industry person said they had a beer that measured a tic over 110, highest they evermeasured in their lab. Look in Mitch Steele's IPA book, there are some data tables. About 100 is the answer I usually say. I will leave this as a reference. This highlights an interesting point: because ‘IBU’ is a flawed system (insert Denny here), and because a hop’s alpha acids can vary from farm to farm or year to year, shouldn’t there be a more accurate way to describe a recipe so it is useful to another brewer using a different AA of the same hop or a different hop altogether? IOW similar to fermentables being described in % of total which is easily transferred from one brewery with certain Brewhouse characteristics to another brewery with different characteristics, shouldn’t hops be described in Alpha Acid Units like Charlie does in ‘the Joy’. ...or at least list the weight along with AA of the hops used so a translation can be made? I wonder why that didn’t take off? ...seems much more useful to me. Kinda like Renner coordinates. It would be so much easier to list “2.5 AAU of x hop at 30 min” (.5 oz of 5% AA ‘x hop’) in a recipe so the user could substitute .71 oz of his/her 3.5% AA ‘x hop’. I think BYO had an article on that. An example would be the recent English Bitter I brewed. BeerSmith defaulted to 11% AA for Target hops. But the Target I received was 3.5% AA. I did a little cypherin and determined the AAU then did some guzintas to get the weight I needed to get the same effect. What I didn’t have was the AA of Target hops the original author used. He just listed x amount of Target. Who knows if his hops were 11% AA or not. Bummer. An example would be the recent English Bitter I brewed. BeerSmith defaulted to 11% AA for Target hops. But the Target I received were 3.5% AA. I did a little cypherin and determined the AAU then did some guzintas to get the weight I needed to get the same effect. What I didn’t have was the AA of Target hops the original author used. He just listed x amount of Target. Who knows if his hops were 11% AA or not. Bummer. Sounds like what you're talking about is HBUs, or Homebrew Bittering Units. We discuss that on the upcoming EB podcast. I was just about to say the same thing..... you're talking about the return of the HBU. James Spencer recently proposed something similar but for post-boil whirlpool hop-stand additions, and he called his the HSBU "Hop Stand Bittering Unit". 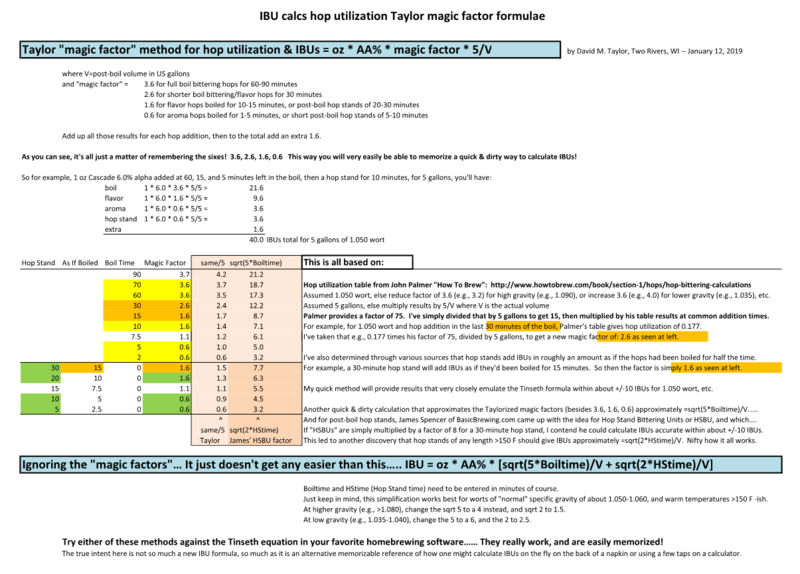 Of course, I got all nerdy about it, spent a few hours doing some math, and discovered that the HBU can be converted into IBUs by multiplying by the square root of (5 times the boil time), divided by the volume in gallons. And for HSBUs, multiply the HBU times the square root of (2 times the hop stand time), divided by volume. These assume a standard gravity wort of about 1.050-1.060. I brew the Swish clone on a regular basis. A slightly bigger beer (OG 1.078) and only use .14 oz of 18.5% Apollo. I then use the rest in the dry hop, even though the recipe I saw says 1 oz, but I figure .86oz is close enough without having to open an other 1 oz pack. AAU was the term Dave Line introduced in the very early English homebrew books. The idea crossed the pond renamed HBU. I mentioned above the formula for comparing the relative effects of hops with different % cohumulone. Put the two together and you can convert any recipe from one hop to a other to get the same bitterness. The resulting figure to compare would be the "Bittering Power" of the CoH formula. Not a real value, just a relative one. Enter all of the other additions, adjusting AA%s as needed and then use the bittering addition to achieve the IBU value stated in the original recipe. However, matching the IBU value for the original recipe will likely not net the same results, but it will give you a starting point. As a rule, you won't match a recipe by following it to a tee anyways. You'd be doing well to even come close unless you've tasted the original and are good at reverse engineering. Does anyone have a corrected version of this recipe?